Year after year I keep telling myself that China’s box office growth has to eventually slow down. An industry that has been rising at a pace 4 or 5 times faster than its country’s GDP for over a decade can’t continue at that rate for long. But year after year I’m amazed that growth just keeps accelerating. From 2001 to 2007, theatrical revenue increased at a 34 percent compound annual rate (as measured in US dollars); from 2008 to 2012 the pace quickened to 43 percent per year. 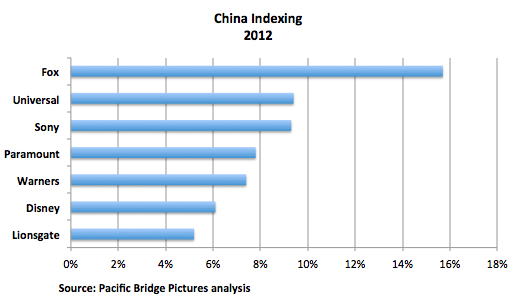 So far in 2013 China’s movie revenue has increased 51 percent, and there’s no sign of a slowdown. Over the past few days China enjoyed a national holiday, the Qing Ming Festival (清明节), and again moviegoers turned out in huge numbers, roughly doubling last year’s holiday box office total with over $31 million in revenue on Thursday and Friday. China is undergoing the largest and most rapid development of a middle class in human history. Hundreds of millions of people are moving up from subsistence to affluence before our eyes. Cinema construction is booming. Thousands of new screens are opening each year, affording millions of potential customers the opportunity—many of them for the first time ever—to enjoy the moviegoing experience in modern multiplexes. The Chinese population has embraced movies, both foreign and increasingly domestically made Chinese movies, with exuberance. High ticket prices and generally mediocre films haven’t deterred them from filling up theaters to capacity. Things will eventually have to cool off, but with so many big cities still lacking multiplexes, it will be many years before China reaches a saturation point. The biggest factor constraining growth is the shortage of screens. There are currently about 15,000 movie screens in 3,700 theaters across the country, the second largest national total in the world, but with its 1.3 billion population China is still woefully under-screened, with just one per every 90,000 people. The U.S. has almost 40,000 screens, or roughly one per every 8,000 people, according to the MPAA. To reach the U.S. level of screen density per capita, China would have to build an additional 150,000 screens. 1. 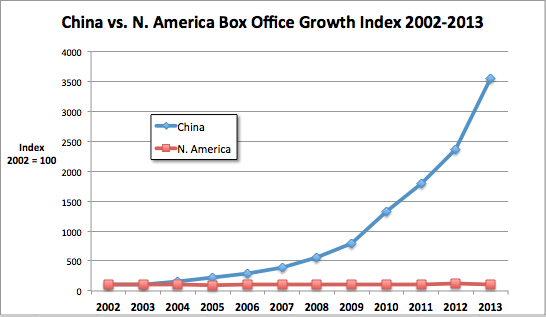 Box office growth in China slows down to 30 percent for the next 3 years, then 20 percent for the following 4 years, then 10 percent for the following 5 years until 2025. 2. Growth in North America maintains its 1.5 percent historical annual growth. 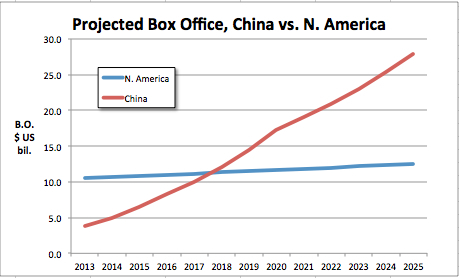 Under conservative assumptions, we’ll see China’s gross box office surpassing that of North America by 2018, and going on to double North America by the middle of the next decade. No other territory will come close even to North America, except possibly India. Hollywood’s century of hegemony over the global movie business will clearly soon come to an end. 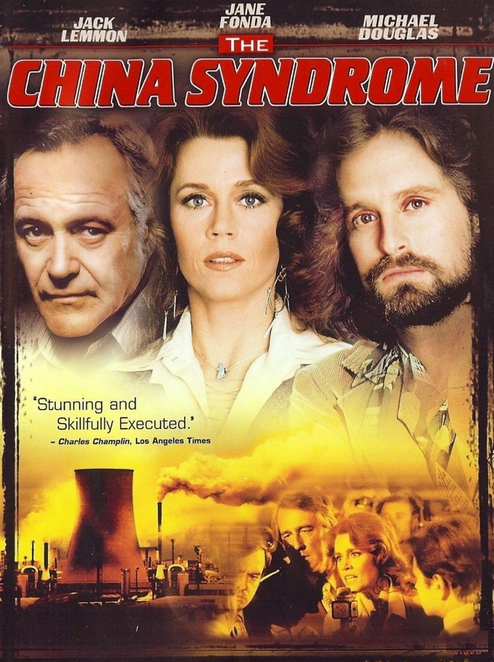 In the 1979 Oscar nominated thriller “The China Syndrome,” a pair of journalists played by Jane Fonda and Michael Douglas stir up a hornet’s nest when they expose a nuclear plant accident that they fear could result in a “China Syndrome,” a worst-case scenario where the reactor core melts through its containment structures and drops into the underlying earth, “all the way to China.” The nasty end result would be a nuclear explosion that would render Southern California completely uninhabitable. The film’s frantic tension arises from the conflict between the journalists’ efforts to obtain justice, and the nuclear plant operator’s self-preserving, sometimes violent attempts to maintain a cover-up of the accident. Fonda and Douglas characters’ righteous ambition winds up getting Jack Lemmon’s well-intentioned plant supervisor killed, and ultimately jeopardizes their own lives and careers, with the film’s final shot suggesting that nothing has really changed. Hollywood’s major studios have set in motion a similarly risky and probably fruitless course of action by complaining publicly about what they feel is unfair treatment of their films in China. In pressing the U.S. Trade Representative to take diplomatic steps, the studios are escalating tensions in a situation that, if continued, could well result in a “China Syndrome” of their own that would poison their long-term prospects in the world’s fastest-growing and soon to be largest movie market. The source of the studios’ discontent is their perception that recent moves by China Film Group have aimed to reduce the grosses of American films at Chinese multiplexes, by setting “blackout periods” during which Hollywood movie releases are limited, and by pitting at least two of these movies, “The Amazing Spider-Man” and “The Dark Knight Rises” against each other on the same weekend. According to the Los Angeles Times, MPAA Chief Policy Officer Greg Frazier admits that the Chinese haven’t really done anything illegal. “Are they violating WTO obligations? Probably not.” To his credit, Frazier has been much more restrained and diplomatic in his statements than his studio counterparts have been. The timing and tenor of the Americans’ complaints betray a complete disregard for the facts, a pronounced insensitivity about current events in China, and an alarming level of ignorance about how to win favor and get things done there. 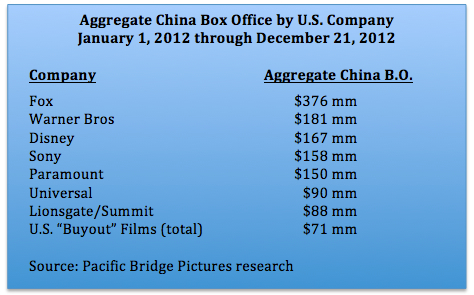 In the first half of 2012, U.S. movies took a 68 percent share of China’s box office receipts. After the summer blackout, their share now stands at 60 percent. Domestic Chinese films have a 15 percent share, and China/Hong Kong co-productions another 23 percent. The rest of the world: 2 percent. “The Amazing Spider-Man” and “The Dark Knight Rises” had China’s third and fourth best opening weeks, and after just 14 days in release the two films are already China’s 9th and 10th highest grossing pictures of 2012. As I pointed out in an article last month, American films enjoy wider distribution, more screens and longer runs in China than do Chinese films. 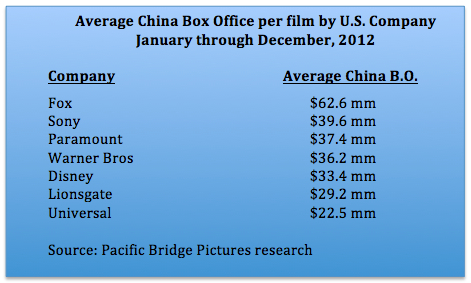 During the past two weeks, U.S. films have taken 98 percent of China’s nationwide movie ticket revenues. Of the 11 highest grossing movies in China this year, 10 are American. The economy is experiencing an epic slowdown, one that is putting tens of millions out of work and raising serious questions about China’s financial viability. The country’s communist party leadership is embroiled in the midst of an unwieldy succession crisis. With a once-in-a-decade power transition about to begin, one of the party’s top political stars has been disgraced with murder and corruption charges, and presumed president-to-be Xi Jinping has completely disappeared from public view, possibly due to a heart attack. Territorial disputes over islands in the South China Sea and East China Sea have escalated to frightening levels, with diplomatic and trade relations between China and Japan deteriorating to post-WWII lows. With all this turbulence, do the studio heads really think this is a good time to complain about movie schedules? Last weekend, the studios made almost as much money in Chinese theaters as they did in U.S. ones. To the Chinese they must seem like unwanted houseguests who, after living in the guest house for a while, have commandeered the master bedroom, eaten almost everything in the fridge, and now they’re screaming bloody murder because the homeowners have told them to stay out of the kitchen on weekends and marked a couple of food containers as off-limits. Meanwhile, the Chinese homeowners are overwhelmed with problems: uncle and auntie have murdered a foreigner in the living room, the phone is constantly ringing with calls from bill collectors, major cracks have appeared in the foundation, and the neighbors have figured out how to open the windows from the outside and hurl insults at them about their previously private bodily functions. And what are these ungrateful Americans doing for them anyway? Only a few companies—most notably IMAX, Fox, and Dreamworks Animation—have made efforts to appease the PRC’s political leaders and make a contribution, by producing and distributing Chinese language films. Xenophobia is on the rise in China, and anti-American sentiment has climbed to levels not seen in decades. The communist leaders can gain much-needed legitimacy at home by standing up to pushy foreigners. If the studios aren’t careful they could easily precipitate their own nuclear meltdown, with China Film Group punishing the studios by shifting their imports toward American indies and non-U.S. films. And a nationalistic boycott of American movies isn’t unthinkable; the territorial disputes with Japan appear to have resulted in lower car sales in China recently for Toyota, Mazda and Nissan. It’s natural during tough times to scapegoat foreigners; both the Americans and the Chinese are guilty of that. The studios should back off and leave things alone until the 18th Party Congress has chosen its new chiefs and the dust has settled on other current crises. The MPAA has done a marvelous job so far and they should keep their powder dry for the times ahead when they can have a meaningful impact with the next generation of leaders. And all of us should learn to take a more conciliatory tone in our conversations with the Chinese. We may not like their style, but they hold the keys to the future of our business. Triggering a nuclear reaction won’t benefit anyone. WTO: WTF? Why Doesn’t China Have to Play by the Rules on Movies? Will China ever live up to its obligations to loosen the importation of Hollywood movies as required by World Trade Organization (WTO) rules? Don’t bet on it. 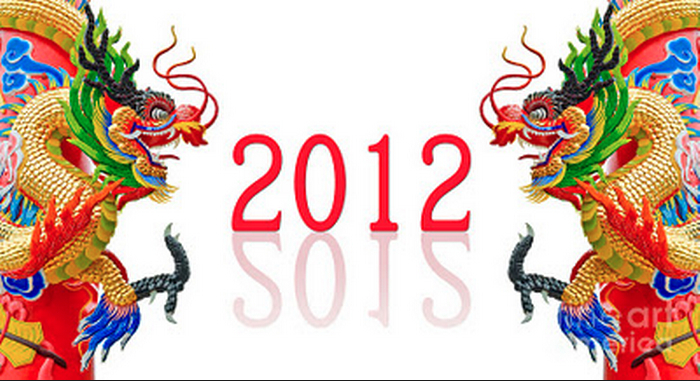 This month marked two major anniversaries for China and the WTO. December 11th was the 10th anniversary of China’s entry into the 153 nation global trade club, an accession that took 15 years of negotiation before it was approved. And December 21st was the 2nd anniversary of the WTO’s formal denial of Beijing’s request to maintain its restrictions on imports of foreign movies and television programs. Although the WTO told Beijing in no uncertain terms two years ago that it had to start playing by the same rules as all the other 152 member countries with respect to movie imports, Beijing has yet to budge. Before China’s accession in 2001, both China and the major developed countries like the U.S. eagerly lobbied for the PRC’s entry into the WTO. China sought freer international access to its exports of textiles, tires, and microwave ovens, and the developed nations saw opportunities both for trade and also to instill the values of democracy and human rights in China. Hollywood, for its part, relished the chance to open up a market of more than a billion potential paying customers for its movies and TV shows. 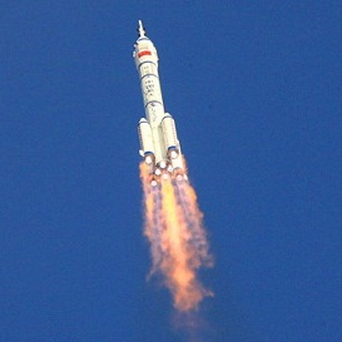 Ten years on, China has won big; Hollywood and those hoping for political change, not so much. Owing largely to its WTO access to global markets, China since 2001 has enjoyed one of the most successful economic periods ever in global history; its global trade has quintupled, and GDP as measured in dollar terms has quadrupled. Hundreds of millions of people have been lifted out of poverty. China now has the world’s largest middle class, and dozens of billionaire fortunes have been made. But those in the U.S. and other developed nations have generally seen China’s WTO membership as a bust for them. Even though it has mostly abided by the letter of its accession agreement, which required Beijing to relax over 7,000 tariffs, quotas, and other trade barriers, it’s a widely held perception that China has often ignored the spirit of the agreement and that the benefits of rising trade have accrued in a lopsided manner to the PRC. As for politics, the WTO has had virtually zero effect on China. If anything, China’s conservative political values have only hardened over the past decade. Speaking to his countrymen just four months after China’s WTO entry, then prime minister Zhu Rongji warned that “Western hostile forces are continuing to promote their strategy of Westernizing and breaking up our country,” and he accused these people of conducting “infiltration and sabotage.” It’s important to note that, although Zhu didn’t specifically mention Hollywood in his speech, the western ideals and cultural values expressed in Hollywood’s films were and continue to be viewed with extreme suspicion by China’s leaders. As far as the U.S. film industry’s hopes went for friendlier trade relations with China, Prime Minister Zhu might as well have been pointing his finger directly at Hollywood. So when the WTO told Beijing two years ago that it was violating its commitments to free trade and that it would have to get its act together on film imports, the Chinese felt they had much to lose and little to gain by complying. Specifically, China was required by the WTO to make two major changes in its policies on film imports. First, that China’s limitation of the right to import films to just two state-owned companies, China Film Group and Huaxia, be abolished. The state monopoly on film importation is clearly anti-competitive, and it allows China to set below-market pricing for the films it allows into the country. As a result, although China is now undoubtedly the biggest foreign market for American movies, with perhaps $7 billion in legitimate and (mostly) black market revenue generated annually by Hollywood films, very little of this revenue—about $200 million by my estimate—flows back to the U.S. The state monopoly creates a double whammy for foreigners: it eliminates their ability to negotiate fair deal terms with legitimate buyers, and it also encourages the system of illegal piracy that imports and distributes the hundreds of films each year that aren’t allowed in via official channels. The second WTO demand was that China end its prohibition against foreign invested enterprises’ (FIEs) ownership of film import and distribution companies. As Berkeley professor and China law specialist Stanley Lubman wrote in an April, 2011 article for the Wall Street Journal, “The exclusion of FIEs violated China’s obligation to treat foreign enterprises the same as Chinese enterprises.” Control of the import and distribution of their films would enable foreign companies to enjoy a much greater share of the value they generate. Two other major barriers to film import that Hollywood would like to see abolished are China’s 20-film annual import quota, and its censorship review of each and every imported film for “content which could have a negative effect on public morals.” Unfortunately for Hollywood, the WTO has not pursued these two barriers to film imports, reasoning that other WTO member countries already have similar restrictions in place. In any event, the rather generous deadline the WTO imposed for China’s compliance with its edicts came and went back on March 19, 2011. China hasn’t made a single change. Despite maintaining a system of trade barriers that former MPAA CEO Dan Glickman called “among the most restrictive and burdensome in the world,” China has been allowed to continue its unfair trade practices with impunity. So what happened? After all this time and negotiation, and despite relentless pressure from the MPAA, Congress, and U.S. trade representatives, why is China still not playing by the rules to which it committed when it joined the WTO? The answer, simply, is that China doesn’t want to and no one can make them. Control over the content that reaches its population is a key pillar of the Chinese Communist Party’s political power. “Public morals” are a genuine concern, but even more than that, censorship is designed to protect the status quo of authoritarian rule. Any ideas and values that aren’t handed down by the Communist Party to the people are potential threats to the legitimacy of government power. An attack on censorship and content controls is tantamount to an attack on the Chinese government itself. So China is deeply entrenched in its position, prepared to wage a much fiercer battle over film imports and restrictions than the WTO, or even the U.S., seems willing to stomach. Assuming that Congress doesn’t have the political will to retaliate by imposing harsh import penalties on Chinese products, Hollywood’s only real options are either to create some sort of trade embargo of its own to pressure the Chinese to accept changes, or to simply abide by the status quo. Either way, American movies will continue to flow into China, whether by legitimate channels or not.